In stock -This product will ship today if ordered within the next 6 hours and 17 minutes. 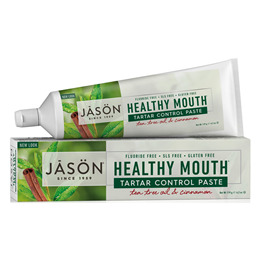 Healthy Mouth Toothpaste allows you to keep your mouth healthy, without harsh abrasives or irritating chemicals, by guarding your teeth and gums from sugar acids and tooth decay. Tea tree oil, a well-known antimicrobial and antiseptic agent, helps defend from the bacterial growth that could lead to periodontal disease. Grapefruit seed and perilla seed extracts help reduce tartar build-up while aloe vera gel soothes gum irritation. A refreshing cinnamon chill keeps your breath fresh all day. Regular brushing in combination with routine dental cleaning helps prevent plaque and tartar build-up. Calcium Carbonate, Aqua (Water), Glycerin, Sodium Cocoyl Glutamate, Carrageenan, Aloe Barbadensis Leaf Gel*, Bambusa Arundinacea Stem Powder, Carum Petroselinum (Parsley) Extract, Citrus Grandis (Grapefruit) Seed Extract, Perilla Ocymoides Seed Extract, Stevia Rebaudiana Leaf/Stem Extract, Cinnamomum Zeylanicum Bark Oil, Eugenia Caryophyllus (Clove) Flower Oil, Melaleuca Alternifolia (Tea Tree) Leaf Oil*, Melia Azadirachta Seed Oil, Menthol, Silica, Sodium Bicarbonate. Adults and children 2 years of age and older: Brush teeth thoroughly, preferably after each meal, or at least twice a day, or as directed by a dentist or physician. Instruct children under 6 years of age in good brushing and rinsing habits (to minimise swallowing). Supervise children as necessary until capable of using without supervision. If you accidentally swallow more than used for brushing, seek professional assistance or contact poison control center immediately. 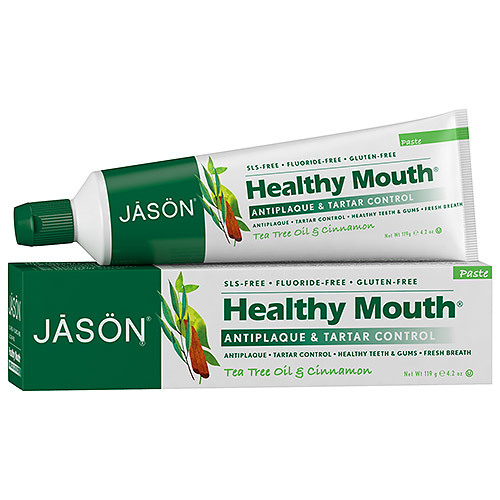 Below are reviews of Jason Healthy Mouth - Toothpaste - Tea Tree - 119g by bodykind customers. If you have tried this product we'd love to hear what you think so please leave a review.